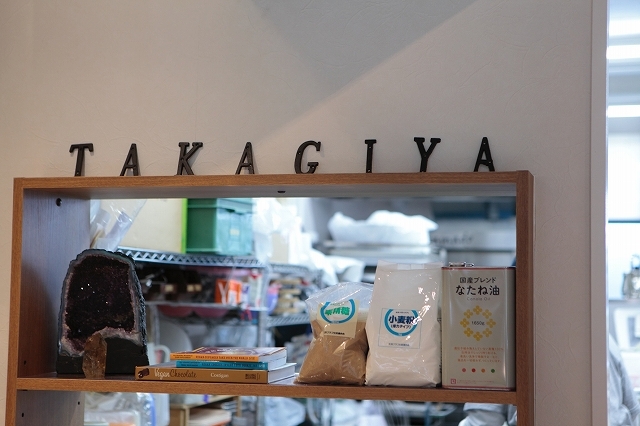 TAKAGIYA is a small vegan-friendly natural café where vegetarians, vegans and anyone can enjoy sweets with their friends and family. We make sweets, beneﬁcial for your mind and body, from carefully selected ingredients. We use ﬂour from home-grown wheat and rice. We don't use reﬁned salt or white sugar, we use sea salt and pure brown sugar. Our organic coconut and canola oils are slowly pressed from home grown rapeseed without using any chemicals. Other than aluminum-free baking powder, we never use additives. We also have 100% fruit juice. We have two kinds of desserts: "WA-nderful" and "Rich cake”. "WA-nderful" are our vegan sweets made 100% plant based ingredients. All our cookies are "WA- nderful." Our sweets are delicious and beautiful, and are made only with safe and reliable ingredients. Vegetarians and vegans as well as people who have food allergies or dietary restrictions due to religious reasons can enjoy these tasty plant based desserts. Our "Rich cakes" are made with safe ingredients that are the same as the "WA-nderful" pastries but uses eggs and dairy. Not only do we use eggs from non-GMO fed hens but we use eggs that have the date they were collected. Our ﬁrst priority is sharing delicious sweets with you. Whether you're vegan or not, you can enjoy eating good quality pastries that make you feel refreshed and revitalized with your friends and family. We hope to share happiness to our customers with our desserts and put a smile on your face. Copyright(c) TAKAGIYA All rights reserved.